THERE IS NO LOVE GREATER THAN THE LOVE OF EATING’.. is a mantra diligently followed as well as encrypted in the menu of Britannia restaurant..
and damn gainsayers , mostly the lot obsessively watching their calories and waists, longingly, pleadingly, lurking around, not daring to venture close when you are probing the Biryani expectantly, excitedly trying to muffle the slurp. Not one to indulge canards, especially those whose authors get invited over and fed with supreme generosity and extreme caution for a kind word in their ‘food guides’, which almost always turn out to be a Bete noire much to our chagrin and disgust, I prefer to adopt the adage literally ‘the test of the pudding is in the eating’. My choice only, especially if it means a meal out . Accompanied by a moody frisson , a trip to town, as we Mumbai-ites call destinations in the Colaba, Churchgate, Cuffe Parade area ( no clue as to its origins) lunchtime is almost always at Britannia, preceded/followed by a movie at Inox. One has been frequenting this little, quaint Parsi restaurant for over a decade. Why? Hobsons choice. For Parsi fare no other passes my muster I’m afraid. You see, at this juncture bearing in mind this pertinent detail is well advised. An aphorism which reads as follows: I am a great cook and only cooks ought to decide supremacy of culinary talent! With that out of the way.. a little about Britannia. It has been a haunt for connoisseurs since 1923., set amidst shady trees of Ballard Estate. Rashid Kohinoor the original owner signed a 99 year lease when it opened shop catering mostly to British officers. Food was mostly bland then in keeping with the preferences of the British. Not much has changed presumably, decor wise. It is unpretentious with its high ceilings and century old fans, polish tables and chairs, with red checkered tablecloths, whiff of divine aromas, no music, just the happy chatter of the guests who march in at lunchtime (it is open only for lunch..they can afford to call the shots..monopoly has its advantages) predominantly the Ad world clique. Not surprising that those who find themselves unable to eat out, order it..but Britannia it must be! Recently on one of those outings, I went in for lunch with kiddo and hubby in tow. 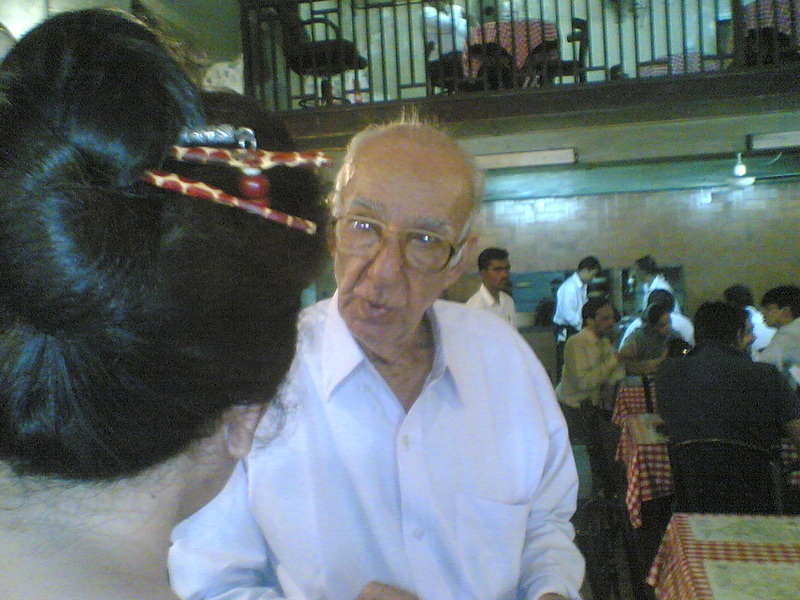 We sat at our favourite table, gleefully smirking at each other for nothing, except the expectancy of the ‘beri pulao’ ( more on that later) when the old, crinkly eyed, ever smiling, most charming gentleman Mr. Boman Kohinoor approaches us unassumingly to take our order. That he is the owner is no deterrent for him to go around merrily servicing customers. We place the order in a matter of minutes since we know exactly what we want…’dhansak, sali chicken and berri pulav…and then proceed to chat. he informs me that Abhishek Bachchan was here a few days ago and ordered exactly what we have. You see the ‘berry’ is especially ordered from Iran even today. He speaks lovingly of his late wife Bachan who was a lawyer and had learnt this recipe on a trip there. With great pride he spoke of the dedication of is sons to carry on the tradition, with Romin coming up early at 4a.m. every day to oversee operations. Food arrives..our chat goes on uninterrupted with Mr. Boman urging me to eat or ‘it will get cold girl’..Girl?! How sweet! Nevertheless.. Desert could not be deserted. was of course the caramel custard which tastes like no other..except when mmmm.. I ma…never mind . Nothing has changed here..not the menu.. the interiors, the ambience..nothing. Nothing will I am sure and nothing should. Timelessness needs validity and we need assurance sometimes..that life can be perpetuated..even if it is an illusion. Ascribing strongly to one of my inveterate preferences, I fear what will happen after the lease expires in 2023. I ask him..he laughs out loud ” I wont be there.. let my sons deal with it”..But you are only 60.. I joke.. he smiles widely.. ‘ No No..take another guess”.. I add on the years slowly, 5 at a time, till he prompts me to take it up to 84! Such a sweet young 84..God bless him! He has given me the recipe of ‘sali chicken'( chicken stew with potato sticks)..in case you want it..Ask and it shall be given. Though.. Britannia is where you want to get your Iranian foodie urge fulfilled. A clue on my food-osophy..
For Parsi food lovers the best eating place in Mumbai according to Kaveetaa…read her review . quite a coincidence that you speak of it since i had been there a week ago.Sali mutton is what I had he beri pulao is expensive I felt but it must be good. Hi dilip…you did go there.. Oh good. yes the beri pulav is slightly more than the other dishes..but its worth it. Kaveetaa have you been to ‘Jimmyboys’? Thank You Maam for writing so kindly. Can you pls pls give me the recipe of Britannia’s Salli Chicken ?